Clear all jellies, bring dawn all ingredients and reach 100,000 points to complete the level. This level has hard difficulty. 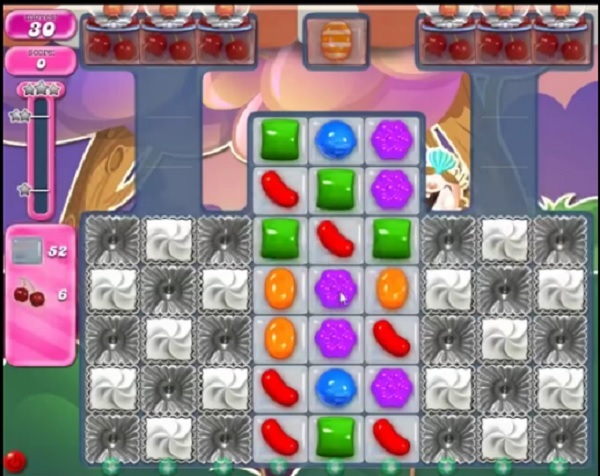 For this level try to play from middle part of the board where more candies are available to play and make special candy. Try to make more striped candy and combine it with other special candy to break the blockers and jellies. Or play near to ingredients to move them and take them out from the board. Or watch video from below to get more help. This level has changed. Top 2 rows in bottom part are 3 jellies wide. Next row is 7 wide. Dead spaces are impossible to clear! Having problem with this level,could use some HELP. Thanks for listening .Appreciate it. Please rescue me from this level. A good board will to it .THANKS!!! 1760 Completed! 2 boards! I used 3 lollipops to clear final jellies. 1760 , its difficult to get lasts few jellies , ended up using two lollipop hammers for winning game . candy does not drop in the top two corners and its impossible to get them. its not the same board as they are showing. the top two corners does not have candy drop in them which makes it impossible to get. the board is not the same as it is showing. This level is RIDICULOUS. I’m tired of trying. I’ve read all the posts. I’ve tried them all. And that stupid island game??? It always comes up on a hard level like this that I can’t get through in time and then there i go getting bumped back…..AGAIN. Totally boring. Designed to make you pay.